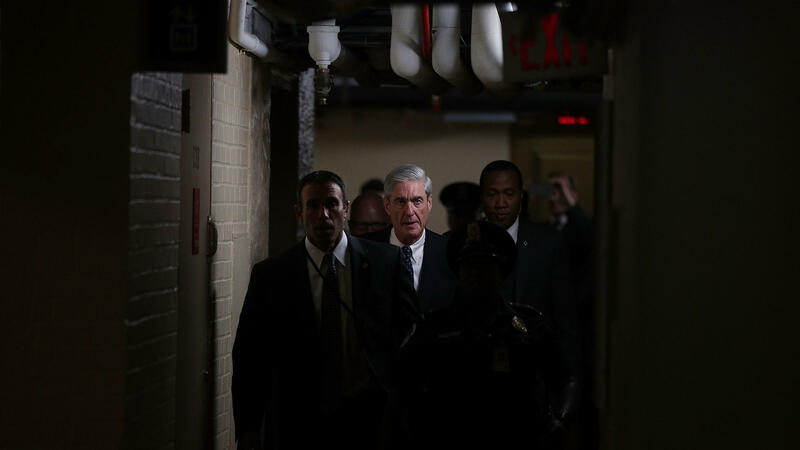 Special counsel Robert Mueller (C) leaves after a closed meeting with members of the Senate Judiciary Committee on June 21, 2017, at the Capitol in Washington, D.C.
GOP voices are accusing the team assembled by special counsel Robert Mueller of bias against President Trump — and they're appearing to set the stage for some action. Senior Justice Department officials are defending the investigation, which has already secured indictments or guilty pleas against four people with ties to the Trump campaign. Here, we consider a few ways the White House or its allies could disrupt the special counsel probe. The idea: Since Attorney General Jeff Sessions recused himself from the Russia probe in March, he is not supervising special counsel Robert Mueller or his team. That means the buck stops with the deputy attorney general, Rod Rosenstein. Rosenstein told the House Judiciary Committee Dec. 13 he has seen no reason that would be "good cause" to remove the special counsel and that he has confidence in the investigation. One way for the White House to shake up the probe is to find a way to replace the attorney general, who is recused, with someone who is not. That person could then exercise more control over the Russia investigation, including nixing some spending by the special counsel, refusing to sign off on interviews of key witnesses or requests for grand jury indictments — or even firing Mueller. The problem: Sessions is having the time of his life at the Justice Department, and doesn't want to go anywhere. Earlier this year, he rebuffed efforts to mount a write-in campaign for his old Senate seat in Alabama, and another effort to get him to move over to the Department of Homeland Security. The idea: This is otherwise known as the modern reboot of the "Saturday night massacre," an infamous 1973 episode in the Watergate scandal where Attorney General Elliot Richardson and Deputy AG William Ruckelshaus refused to remove the special prosecutor, and quit their posts in protest instead. Ultimately, then-Solicitor General Robert Bork agreed to get rid of the special prosecutor, Archibald Cox. Public outrage ensued, a new prosecutor was named and Nixon resigned the following year. The problem: the current Deputy Attorney General, Rod Rosenstein, appeared to draw his own line in the sand in recent House testimony, telling lawmakers that special counsel Robert Mueller was among the best civil servants and law enforcement officials in modern history. The new FBI Director, Christopher Wray, is also a fan of Mueller's. And in a standoff during the George W. Bush presidency over surveillance measures the Justice Department balked at approving, Wray also volunteered to resign in protest along with a series of other senior DOJ officials. In other words, the specter of another mass resignation at the top of the Justice Department and the FBI would loom large. The idea: Led by Rep. Matt Gaetz, R-Fla., several GOP House members have demanded the Justice Department appoint another special counsel to investigate the FBI's handling of the Hillary Clinton email investigation during the 2016 presidential race, to look into allegations surrounding a uranium deal or to examine alleged conflicts of interest within the FBI and the Justice Department. The idea's won some support from Jay Sekulow, a lawyer for President Trump. Last month, Sessions told the House Judiciary Committee the possibility of appointing a special counsel was one of the approaches he'd instructed senior Justice Department prosecutors to consider and make recommendations about. The problem: There are rules for triggering a special counsel appointment, including a need for evidence that a crime has been committed and that the Justice Department's thousands of existing prosecutors cannot handle it themselves because of some kind of conflict. When Rep. Jim Jordan, R-Ohio, pressed the attorney general about the matter in November, Sessions replied, "Looks like is not enough basis to appoint a special counsel." And — one more problem — getting rid of Mueller, or the entire team, by re-writing regulations that govern the special counsel, wouldn't necessarily end the investigation. The FBI and existing U.S. Attorney's Offices might pick up the probe where Mueller leaves off: either by continuing to examine the counterintelligence aspects of Russian interference, or investigating conspiracy or other potential crimes by people inside Russia and the U.S.